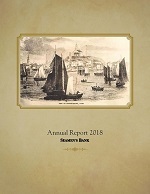 With my planned retirement in June, I wanted to publish an Annual Report that represented what I believe the Bank means to the community and so, in a nod towards my penchant for history, we have assembled a report that outlines the years of Seamen’s Bank from its beginning in April of 1851. It’s not surprising, given the success of Seamen’s, that during my tenure as President the Bank has been approached several times by other banks wishing to merge. It is that predilection for community, employee welfare, and history that guided me through those conversations. Indeed, our annual planning sessions have always been framed with one overriding goal that has become a standard phrase in those reports: to preserve and strengthen Seamen’s Bank as a mutually-chartered, fully-independent, community institution. From a performance point of view, our decision to grow our loan portfolio proved to be very successful and this past fiscal year was marked by a substantial increase in real estate mortgage loans. Total loan footings grew by more than $31million – an increase in excess of 13%. Net interest income, a prime indicator of success in a small community bank, grew by $838,000 or 8.3%. Our deferred tax position was negatively affected by the corporate tax cut affecting our net income for the year but we expect to reap the advantages of that tax break in the coming fiscal periods. With the added strength of a strong capital position, we have the resources to continue to prosper in the coming years. Of course, a true community bank does more than just provide banking products. Through their selfless participation in community events too numerous to mention here and, as members of various non-profit boards, our Community Team of employees and trustees exemplify the community-banking ideal. Adding to these efforts is the work of the Seamen’s Bank Charitable Foundation which remains an ongoing source of pride for us, distributing over $125,000 annually to local charities. Seamen’s has always been more than just an employer and I consider it a privilege to have been a part of its history as President for the past 25 years. While my tenure as President may be ending, I expect to remain a part of Seamen’s Bank in my role as Chairman of the Board of Trustees and am confident that the historic legacies of Seamen’s Bank will endure. In closing, I remain grateful to my fellow employees and trustees of the Bank and to the customers and community at large for their contributions to the success of the 167-year-old tradition of community service that is Seamen’s Bank.